1. These instructions provide step by step advice for activating your seneye home, pond or reef device. These instructions provide step by step advice for activating your seneye home, pond or reef device. The seneye device can be used in the following ways. Online will give you constant uploads to seneye.me with alerts. Offline will allow the device to work as a data logger and upload readings when the device is next connected to a PC using SCA. Connect your seneye directly to the PC. If your computer or laptop isn’t close enough you can extend the cable length by 2.5m using the seneye USB extension. For those who require even more range, the seneye active USB extension cable allows the cable length of the seneye device to be increased by an additional 15m. The seneye device can also be connected to a wireless USB bridge giving increased flexibility over Wi-Fi. You will however still need a PC running the SCA. Windows XP, Vista 32-/64-bit, Windows 7 32-/64bit, & Windows 8 32-/64bit. HTML web browser: Internet Explorer 8.0+, Firefox 4.0+, Safari 4.0+ & Chrome. The SWS removes the need for any PC in the house and will connect your seneye to your internet router. It will then send results directly to the seneye cloud website. Visit seneye.com/coming-soon for more information. With the SWS you can use a seneye device and an apple computer. If you are using your seneye with a Seneye Web Server please follow these instructions. After initial set up, your seneye can be connected to a seneye USB power adapter. This option is great if you don’t wish to have your seneye device constantly connected to a PC. When powered by the USB Power Adaptor, readings are stored on the internal memory ever hour. Warning lights are displayed on the on the seneye device if the water parameters are bad. You will not receive alerts via SMS or Email. 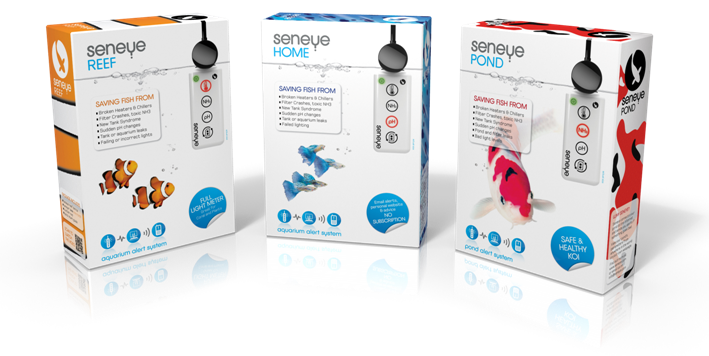 The following instructions are a quick set up guide for the seneye home, pond and reef. If you have no previous seneye experience we suggest you read the full instructions. Your slide is delivered dry. Soak in your aquarium/pond for a minimum of 24 hours (48 hours for marine) before use. If you do not soak your slide the pH will read low as the chemistry will be dry. If you do not have a slide soaker they are available from the seneye store. Alternatively the slide can be soaked in a cup of aquarium water. We will send you a seneye welcome email with your seneye.me details on. After completing the registration you will be presented with the option to download the SCA. Tip: You may need to disable your virus checker to allow the download and install. Before launching the software we advise you also add ‘c:/seneye’ and ‘seneye.exe’ as an exception. For more information click here. Failure to do this may lead to complications later. You can also find the software download on this link. After the download has completed double click the downloaded file. Follow on the on screen instructions to install the software. Once installed, your SCA can be opened using the icon on your desktop or in the start menu. 2. Select your chosen language. 3. Enter your e-mail address when prompted; use the same email address that you registered with on seneye.me. 4. Connect the USB lead from the seneye device to your Windows computer. 5. After a short while the SCA will prompt you to enter the name your seneye device. (for example: John’s seneye) If it does not ask you to name please read this troubleshooting link. The seneye connect application once launched will look like somthing like the screen below. WAIT! Your seneye will be configuring in the background. Please leave connected to your PC (and running) for 1 hour to ensure the internal clock has been powered fully and syncing has completed. Once fully synced the SCA will show all the device info. Each seneye slide has a unique activation code which you must register to your seneye device. This allows us to ensure your device uses the correct ,maths for the slide type and batch. This link shows the ways to register your slide. You will need to do this with each new slide. 1. Remove the black plastic back cover from the seneye device. 2. Take your pre-soaked slide and insert it into the device, taking care to hold it on the sides so the sensor areas are not touched. Ensure no air is trapped between the slide and device. This process is best carried out with the device under water. 3. Replace the back cover on the seneye device. Tip: To ensure continuous and accurate readings for pH and ammonia, you should simply replace your seneye slide each month. Ensure that the drip protector is located on the end closest to your USB connector. The drip protector should be located at the lowest point on the cable. Your seneye device is designed to remain submerged. The seneye slide should not be allowed to dry out after intial soaking as this may give inaccurate readings. If your seneye slide does become damaged, please replace with a new one or contact [email protected] for more information. 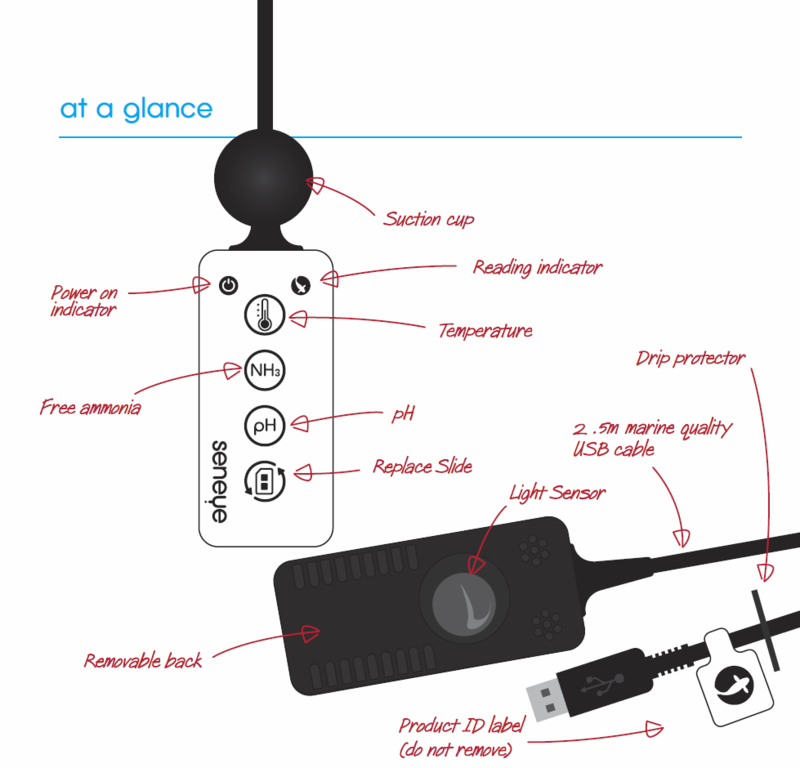 In an aquarium your seneye device should be attached using the supplied suction cup. Position the seneye device close to the filter or in an area of high flow to ensure sufficient water flow through the device. TIP: If the device is mounted to the back of the aquarium with the white face looking in, it could read out of water. Make sure the back of the device looks into the aquarium. If you are using the light meter, then we recommend that you attach the seneye device to the front of your aquarium. If you wish to take precise light meter readings, use the light meter suspended below the water level pointing directly towards your aquarium lighting. This link explains more. You can place your seneye device inside your pond filter or float it on the surface of your pond. If you are using your seneye device in the filter, then we would recommend that you position it so if you have a leak the seneye device will not remain submerged. If your seneye device is connected to an internet enabled PC, you can choose to receive an alert if this happens. You can leave the seneye device floating in your pond. However if you would like to know if your pond has a leak, we suggest you teather the cable to the side of the pond so if the water level does drop the device is held out of water. If your SCA is not running please launch it now with your device connected to ensure that your readings are posted online. When the seneye device is connected to your computer and the SCA is launched, any stored readings will be automatically uploaded. During this process egg timers may be shown,and live readings will not show until this process has finished. Do not unplug the device. If you wish to use the device offline, please disconnect the device only when the SCA has finished uploading readings. Graphs for these readings will be produced once they have been received and analysed. Depending on the number of uploads this process can take a few minutes. You can add mutiple seneye mutiple devices to the same PC and account. This link explains how. Once the SCA is running you will see that that ‘Current Readings’ page is displayed. Your ammonia (NH3), pH, and temperature are displayed in the boxes. If one of these parameters is outside of your warning levels then the box will turn red alerting you. You can edit the alert level ranges for parameters on your www.seneye.me account. On the image above the box on the far right shows if the seneye device is submerged or disconnected from the computer. The seneye device takes reading every 30 minutes when connected to a PC. The information at the bottom of the page shows when the last reading was completed. This reading will be sent when the seneye server can be reached. The seneye logo circled above will show green if it can see our servers and red if it cannot. If you have an issue with it showing red please or data not going to seneye.me please click here. The seneye uses different maths depending on the ionic strength of the water and for this reason you will need to activate the use of the marine pH maths line to ensure the accuarcy. Click this link to learn more on how to activate the marine maths. 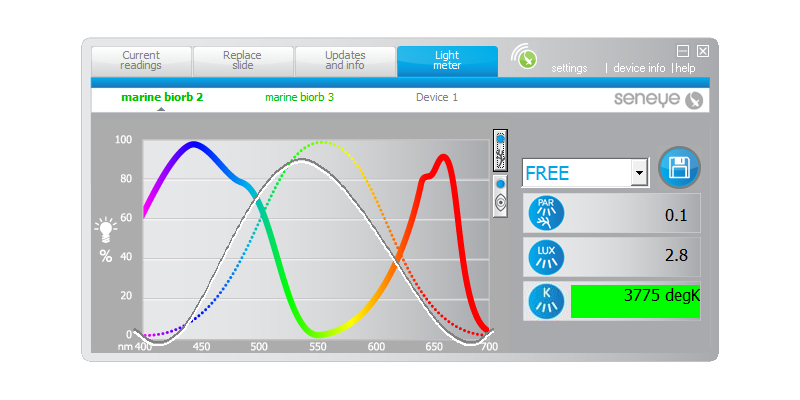 The seneye reef adds a whole load of features to help you better understand the light in your aquarium. Light causes plant and algae growth so understanding it is of great importance. This link explains how to use the light meter and what it does. The data received from your seneye device will be automatically uploaded by the SCA. Data from your seneye device will be uploaded very 30 minutes when connected to your PC. 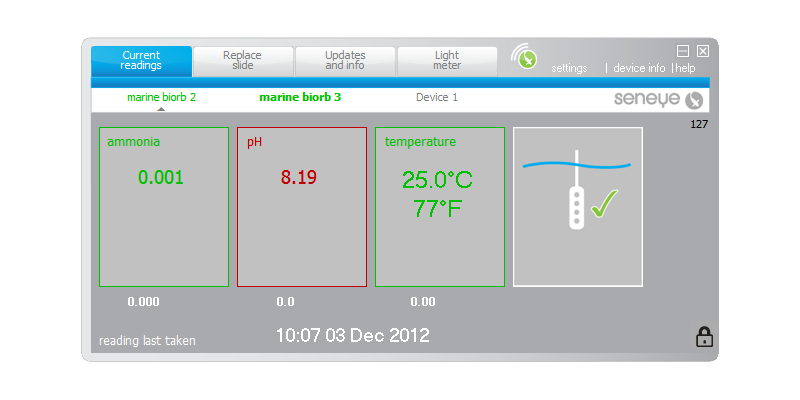 These readings will be automatically graphed so you can easily see how your aquarium / pond is performing. If there is a problem we will automatically send you an email and text message. From your seneye dashbaord you can also search answers.seneye.com to get advice on what action your should take to improve the water quality for your fish. Seneye.me is HTML 5 compatible and works with all major operating systems and browsers such as apple, windows and linux. The seneye website uses the latest in web technology to offer the most rich experience. We therefore recommend that you use the latest version of your choosen internet browser. Seneye recommend Chrome or Firefox. This link will take you to a specfic set of pages on seneye.me to help you get the most out of your seneye. Got a problem with your seneye or just want to find out more about fish keeping? Then try searching seneye here on answers first, we are constantly adding more content. Please ensure you use or give us your seneye.me email address as used to register. If you have a specific issue with the SCA or browser, please include a screen shot when possible. The more we know the better and faster we can help. Help is also available direct from your seneye.me account via the information widget. seneye has wide range of accessory products and we suggest that have a look through this catalogue to decide what you may need. seneye is committed to reducing its impact on the environment by producing high quality and robust products that last for many years. When disposing of this product’s packaging, please ensure that it’s recycled. Do not dispose of your seneye product with your domestic rubbish at the end of its useful life. The seneye device contains a battery which must be disposed of in the correct manner. This product contains materials which, when processed correctly, can be recovered and recycled. You can take this product to your local recycling centre. Your local municipal authority can advise you of the collection facilities available for electronic waste products in your area. Alternatively you may return your seneye device to seneye ltd for safe disposal. Make sure that all electrical connections are properly made. Do not connect your seneye device to the USB Power Adaptor accessory (optional) until you have properly connected any other leads. Your seneye device is intended for underwater use. Do not leave your seneye device connected to a power supply and left for long periods out of water. Doing so may result in damage to the slide. Do not place your seneye device on, or directly next to, your aquarium heater. This placement will give incorrect readings and may cause damage. The maximum water temperature should not exceed 50oC. Ensure that the drip protector is located at the lowest point on the cable. If the USB connector becomes wet do not insert into your PC USB port until completely dry. Do not look directly as the sensor readers underneath the back cover. LED’s are very bright.